One of the first questions we get from relocating homebuyers concerns the home prices in the most popular neighborhoods in Tallahassee. They want to know what they can expect to find and what they should expect to pay in the areas that are most active in the Tallahassee real estate market. From Killearn Lakes Plantation in the North to Southwood in the South, each community offers different home styles and they come at differing costs. 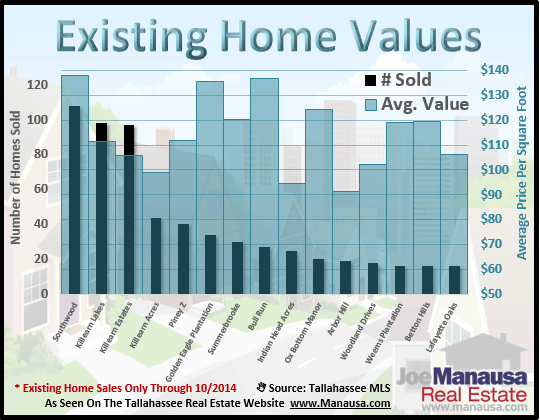 Today's report features the top neighborhoods in Tallahassee, and it includes graphs featuring the average existing home prices and values, along with the number of homes sold for each. The following real estate graphs were created using existing home sales, removing all new construction so that valuations and prices reflect what home sellers are "getting" at the closing table in 2014. 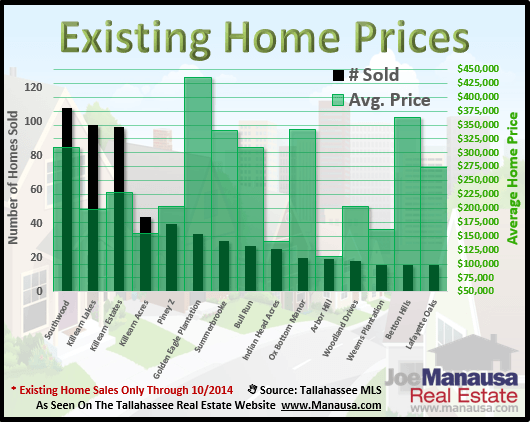 This first graph shows the top selling communities in Tallahassee, and what the average existing home price for each has been through October in 2014. In the graph above, we see the total number of homes sold in 2014 as black bars (measured on the left vertical axis), and the average home sales price shown in green (measured on the right vertical axis). The most active community in Tallahassee is actually Killearn Lakes Plantation, but the Tallahassee MLS segments it into many of the neighborhoods found within its boundaries (Golden Eagle Plantation is just one of these), thus Southwood tops our list with 108 homes sold and closed so far this year. The next graph is very similar to the first one, except this version shows the average home value by neighborhood (measured in price per square foot on the right vertical axis). This graph shows where you can expect to get the most "bang for your buck," as well as the varying value differences between neighborhoods. Thinking about buying a home in Killearn Estates? Expect to pay between $100 and $110 per square foot. Want a house in Southwood instead? Well, expect to pay nearly $140 per square foot. Knowing what to pay and how each neighborhood is trending is a key value that our real estate buyer's agents provide for people looking to buy a home in Tallahassee. It's one thing to say we know the area, but having the top market valuation model in town is one way we save money for homebuyers all year long. If you are thinking about buying a home in Tallahassee and are concerned about paying the right amount when you buy, just drop me a note and we'll be in touch to help you get a great deal in the Tallahassee real estate market.